It is both our mission and passion to offer only the best accommodation experiences to our valued guests. If there is anything about your stay that you would like us to improve upon or continue doing, we welcome your feedback! 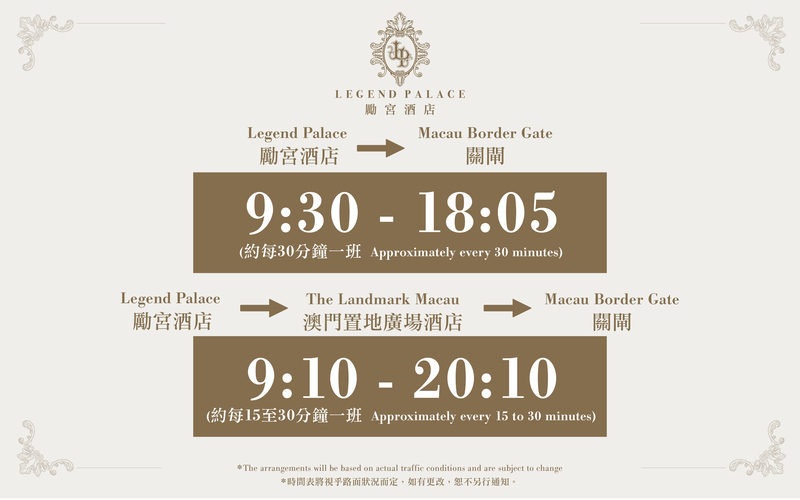 The Legend Palace Hotel is a 2-minute walk from the Macau Ferry Terminal. 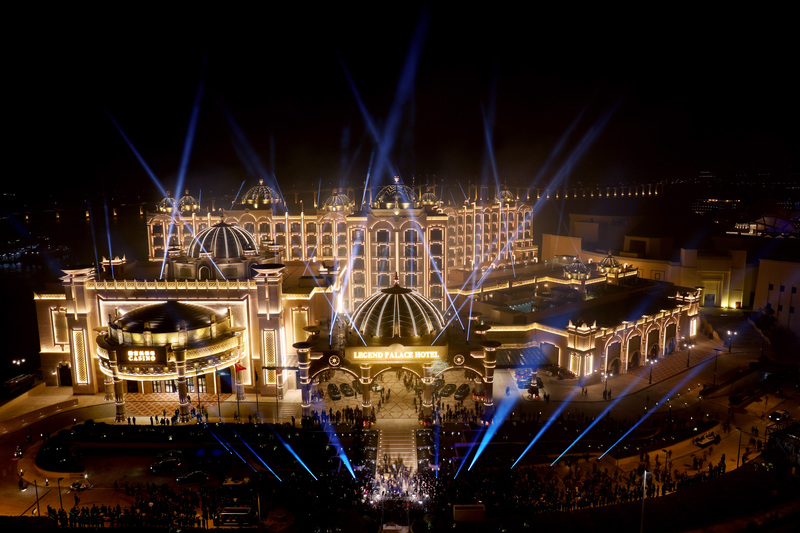 Alternatively, guests may choose to take a complimentary ride on the shuttle bus from the ferry terminal to the hotel or take the public transportation to the Macau Fisherman's Wharf. Guests can take the public transportation to Macau Fisherman's Wharf. 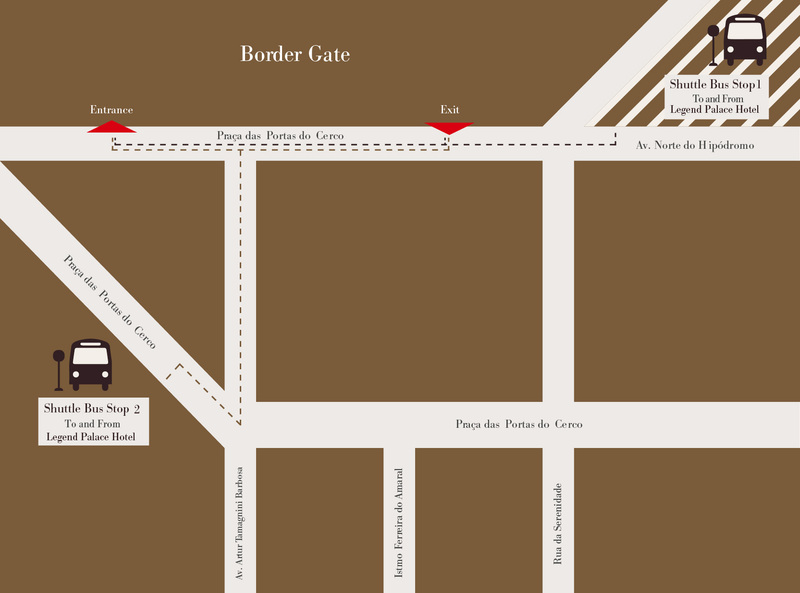 Proceed through Customs and, once in Macau, take the shuttle bus or public transportation from the Gongbei Border Gate to Macau Fisherman's Wharf. The Legend Palace Hotel is a 20-minute taxi ride from the airport to the hotel. Alternatively, guests may choose to take the public transportation. A direct express ferry whisks you from HKIA directly to Macau Customs within the hour, without the need to pass through Hong Kong Customs. Limousine, shuttle bus and taxis are available for transfer to and from the Macau airport, Taipa Island and Macau downtown area. Our Concierge will assist you in making all the necessary arrangements for any transportation requirements during your stay. All visitors must hold a valid passport or travel document. If travel arrangements are made through an agent, the visa processing must be handled by the agent as well. For more information, please visit the Macau Tourism Website. The oldest and most famous Taoist temple in Macau, the temple is dedicated to Matsu, the goddess of seafarers and fishermen. The name “Macau” is thought to be derived from the name of the temple. Senado Square has been Macau’s urban centre for centuries, and is still the most popular venue for public events and celebrations today. The square is surrounded by pastel-coloured neo-classical buildings, creating a consistent and harmonious Mediterranean atmosphere. What is the check-in/ check-out time? The check-in time at our hotel is 3pm and check-out time is 11am. Is there a place to store my luggage if I arrive before my check-in time or check out early? Yes. You may store your luggage at the Concierge. Our hotel offers 24-hour valet-parking or self-parking service. Is Wi-Fi available at the hotel/ in the room? Wi-Fi is available free of charge in the rooms and throughout the public areas for all hotel guests. 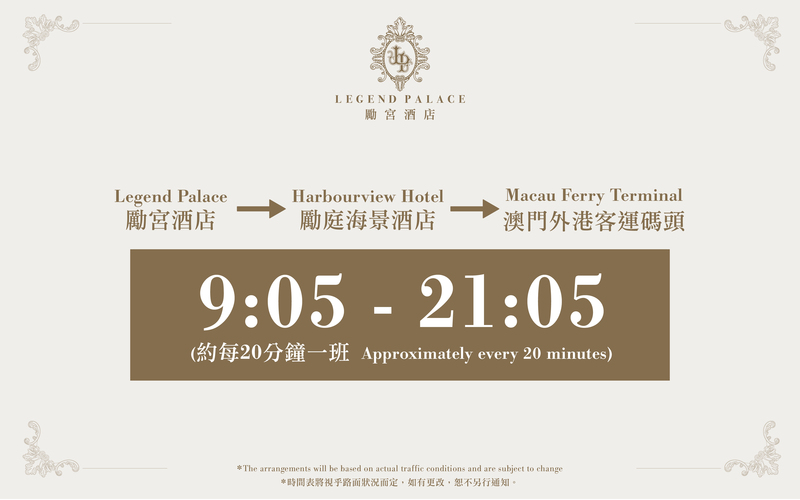 How can I get to Legend Palace Hotel? 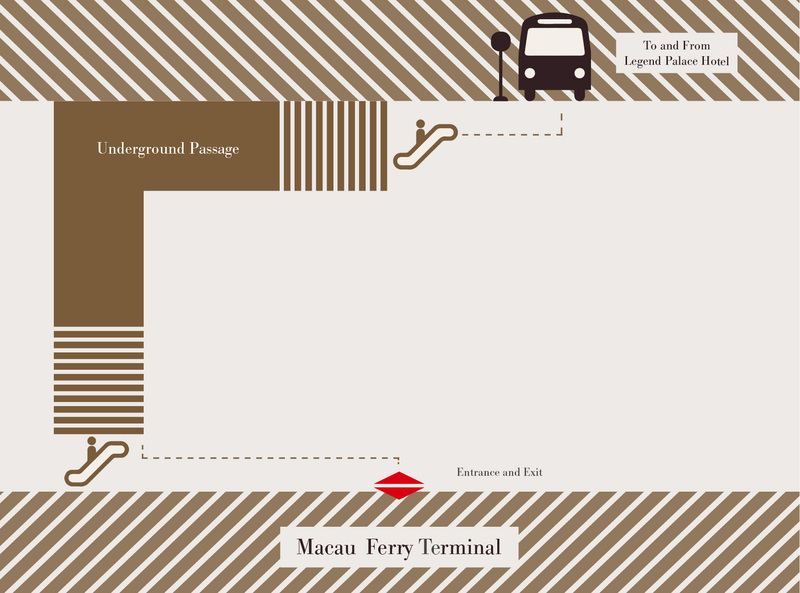 Limousine, shuttle bus, taxis and public transportation are available for transfer to and from the airport, Macau Ferry Terminal, Taipa, Border Gate, Coloane and Macau downtown area. Our Concierge staffs can assist you in making all necessary arrangements for your transportation requirements during your stay. What should I do if I lost or forgot something in my room? Please contact the Front Desk at our hotel or call at (853) 8801 8801. Yes. It is open for your convenience every day from 10am to 7pm. Services available include Internet access, facsimile transmission, photocopying, printing and binding. Do you have a ballroom? Yes, you can request for business conference or banquet use. Please contact us at (853) 8801 8801 for more information. Pets are not allowed in the hotel, except service animals for special needs (Identification is required). How can I book Legend Palace Hotel? Legend Palace Hotel offers various booking options. You may contact our Reservation Team at (853) 8801 8800, or contact us anytime directly via email or fax. The easiest and quickest way is to book via our booking engine. How do I know if the room is bookable? Please click the “Book Now” button on the upper right corner and enter the arrival and departure date as well as the number of rooms. Availability will be shown on the calendar. When you make a reservation online, over the phone or fax, a confirmation email will be sent to your provided email address. What is the minimum age requirement to check-in to the room? Yes. Connecting rooms will be available upon request, but are subject to availability. A credit card is required to hold your reservation. We accept Master, Visa, American Express, JCB and Union Pay.